I’ve seen Bettina Hansen a few times in recent months (she’s a recent transplant to Cascadia) but never once did she think to mention this awesome photo. 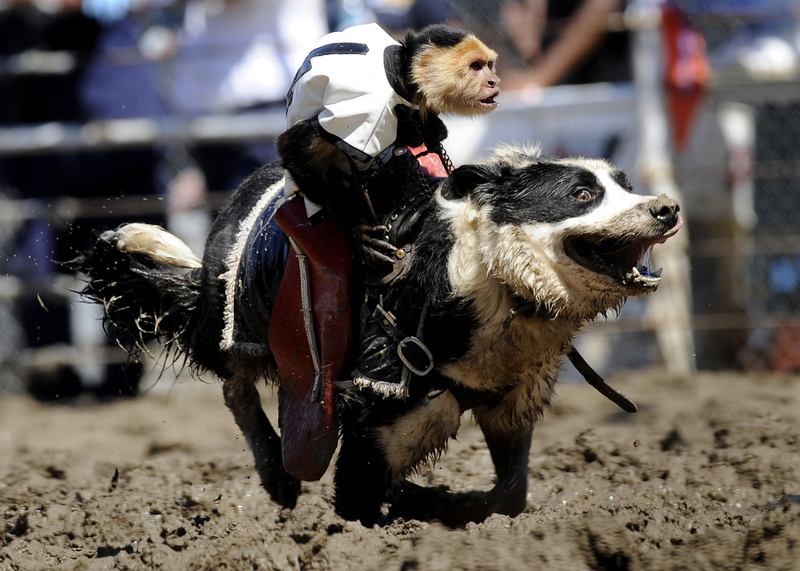 Maybe I got sucked in by the fact it is A FRIKKING MONKEY RIDING A SHEEP DOG IN SOME MUDWORLD MAMMAL OLYMPICS! … maybe the photo is a document of animal misuse. It’s mad-bonkers. Either way, this photo of animals being forced to do unnatural things under the watchful eye of humans seemed to say more about the Angola Prison Rodeo than the thousands of images I’ve seen of people at the Angola Prison Rodeo. It’s a weird event. See Bettina’s full set from the Angola Prison Rodeo. Guilty. Thanks for digging this up, Pete. I would love to go shoot it again, not as a 23-year-old intern. This is the most requested photo I have ever taken. Makes me die a little bit inside when I think about that. The 47th annual Angola Prison Rodeo took place at the Louisiana State Penitentiary in Angola, La. on Sunday. The rodeo, started in 1965 as a form of entertainment for the prisoners and guards, was opened to the public in 1967.